Neil and Scott Rubinstein were two young woodworkers traveling across the Northeast exhibiting their work at various craft shows. By 1981, Neil and Scott weren’t just woodworkers, they were also fathers, and they wanted to find a way to enjoy and promote their craft while supporting their families. Craft shows were what they knew, so they took matters into their own hands. Rather than working for someone else 5 days a week, they decided to dive into the promotional end of the business and create a show that would be about art and for the exhibitors. They called it the Woodstock Art & Crafts Fair, and it was to be held twice yearly, over Memorial Day and Labor Day weekends. The most important ingredients in a good craft show are talented artists and unique, hand-crafted art. So, before advertising and trying to attract customers, Neil and Scott focused on getting exhibitors. They knew that the show was predicated on the art and the artists themselves and that customers and visitors don’t matter if you don’t have the goods. As craftsmen themselves, Neil and Scott were part of artist communities in the Northeast and reached out to fellow artisans– many of whom liked the idea of a craft show run by craftsmen. The show was in the works, and Woodstock, NY seemed like the perfect location for it. Both Rubinstein families had just moved out of the city to this cozy town full of artists and musicians, and the name itself conjured up memories of one of the most successful festivals of the 20th century. After meeting with town officials, the show was approved. But it wasn’t long before the town of Woodstock started worrying. Where would everyone park? Can the town accommodate large crowds? Will a large show disrupt picturesque Woodstock? At the last minute, the town requested that they move the event elsewhere. Neil and Scott weren’t too keen on changing locations; they had already signed a letter of intent with the town, and besides, they thought “Woodstock” had a nice ring to it. Because they were well on their way to signing a formal contract, the town helped them out in finding the brothers a new location– and fast. They were sent to the Ulster County Fairground in New Paltz, just one exit south of Woodstock on the NY thruway. As soon as they set foot on the fairgrounds, they knew it was a perfect fit. 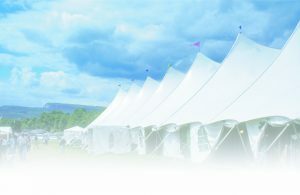 The Ulster County fairgrounds offers tons of parking, is nestled underneath beautiful and historic Mohonk mountain in an artsy college town, and is just 1.5 hours north of New York City. And just like that, The Woodstock Art & Crafts Fair became the Woodstock-New Paltz Art & Crafts Fair. The Woodstock-New Paltz Art & Crafts show started out as a family business, and remains one to this day. It’s not only that the Rubinstein brothers were co-creators and directors of the fair, their wives and children and close friends performed important (and fun) jobs from day one. Ilene and Marsha (wives of Neil and Scott, moms to all) were the original food vendors–today there are dozens–and sold pita sandwiches at I & M’s pita palace. Actually, our favorite hang-out spot is still a family food booth. Only now it sells handmade ice cream and is run by Ilene, since Marsha– an accomplished potter– has her own ceramic booth inside the B tent. Demonstrations of the art process have always been focal points of the shows. We realize the value inherent in viewing artwork in process. It’s great to know something is hand-made, but it’s even better to see an object evolve and materialize. The Woodstock-New Paltz Art & Crafts Fair has evolved into a highly successful event, voted one of the top art and craft shows in America by Sunshine Artist Magazine. Over the years, the fair has attracted the finest artists and craftspeople from across the country. We continue to welcome tens of thousands of visitors through our gates every Memorial and Labor Day weekend.